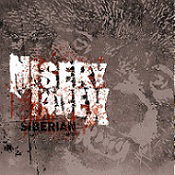 Misery Index from Maryland turn in a mid-paced cruncher, more of a moody and textured thing than slam-a-rific. These guys are an intelligent grind band as they continue to demonstrate, even citing source material for the lyrics. Lock Up from the U.K. serve up two grinders of the style and quality we expect from the band. It sounds like Lock Up, which is a good thing. A solid 7” well worth looking for. This entry was posted in Reviews and tagged grindcore, Lock Up, Misery Index, UK by Editor. Bookmark the permalink.